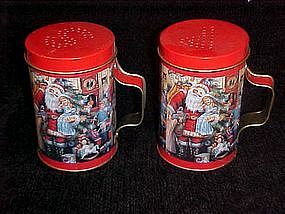 Nice large tin salt and pepper shakers with a litho print of Santa Clause surrounded by children and ooodles of toys and Christmas joy. Measures 4" tall. Lids snap off for filling. S&P pour holes. Nice condition.